Innovative, rugged, lightweight, aerodynamic trailers specifically designed to haul motorcycles from the ground up—not lawnmowers, plumbing supplies, atv’s, dry wall, etc. True motorcycle trailers designed from the start to carry motorcycles. Easy to use—Enclosed trailers with front rolling jacks, single torsion axles, tailgate/loading ramps, minimal tongue weight, drive-in-step-off proprietary wheel chocks and pre-positioned d-rings, eleven feet between the ball and the axle and a flip top for plenty of loading headroom. Everything it takes to make a motorcycle trailer easy to use. Easy to tow—Fiberglass bodies and aluminum chasses make it easy to start and stop and go up and down hills, flip tops and “bomber noses” defeat strong cross winds and a single axle is properly positioned to simultaneously prevent fishtailing and tow vehicled sagging in the rear. Everything it takes to make a motorcycle trailer easy to tow. Easy on fuel mpg—Streamlined flip top fiberglass bodies, and aluminum chasses limit the total weight being towed and limit wind drag so much you can often forget you are towing an Ironhorse Trailer. Everything it takes to make a motorcycle trailer easy on fuel. Easy to look at—Sculpted, seamless, rivet-less, aerodynamic fiberglass bodies with gel coat surfaces provide timeless good looks. Everything it takes to keep a motorcycle trailer looking great with minimum upkeep. Safety and security—Proprietary systems for holding your bike(s) upright while you tie them down. Everything it takes to keep your bike(s) safe when your are underway and secure when you are parked. Trouble-free—Maxxis tires, E-Z lube bearings, self-adjusting brakes, and wiring routed though conduit and large aluminum C-channels combine to eliminate road hazard issues. Not to mention shrink wrapped connections to sharply limit corroding wire connections. Everything it takes to make a trailers as trouble-free as possible. Depreciation—Many Ironhorse Trailers retain much of their value for 10-12 years. So much so that used ones rarely stay on the market more than a few days. In fact when it comes to value retention, Ironhorse Trailers’s track record is unprecedented and unparalleled. Think 75% after five years! Ironhorse Trailers manufactures composite based low profile fliptop and tilt-to-load open motorcycle trailers. Since 2003 our Ironhorse Motorcycle Trailers have been known for Made-in-America quality, as well as their innovative aerodynamic design. Our motorcycle haulers have incomparable reliability, durability and unprecedented user friendliness. No other bike haulers with full-sized, high speed tires are this easy to look at and use with so little effect on your gas mileage. At Ironhorse we have 2 styles–enclosed or open. Our trailers are designed for one bike, one trike, or multiple motorcycles. We sell Factory Direct, but also have a small, trusted dealer network that you can purchased from. Our enclosed model range we have the 1 BIKE FLIP TOP , 2 BIKE FLIP TOP and the WIDEBODY. The newest models in our lineup are the open bike haulers which include the LOAD 1 N GO and the LOAD 2 N GO. What makes a trailer easy or hard to use? Length, whether it has a rolling jack, number of axles, type of loading ramp, type of wheel chock(s), locations of chocks and d-rings. The shorter the trailer the harder it is to back. With two or more axles, and no front rolling jack, you can forget moving it around by hand to put it away or get it back out to use. The greater the tongue weight, the harder it is to “nudge” a little when you still aren’t quite able to “spot” the ball under the coupler on the first three or four tries. U-shaped drive-in-fall-over wheel chocks make loading and tying down a two person job. Trailers with tailgate/ramps are a lot easier to use than ones with portable ramps which have to be retrieved and positioned before you can load or unload your bike and then put away and secured afterward. What makes a trailer hard or easy to tow? If it’s too heavy, going uphill is hard and going downhill is an adventure, not to mention the challenge of emergency stops. If it is shaped like a gigantic brick, it is hard to tow and hard to keep on the road in cross winds. On the other hand, if it is shaped like the nose of a WWII bomber, it will be a lot easier to tow. Then there’s balance. If the axle is well behind the center of the load (motorcycle), the rear end of your tow vehicle will sag and you’ll have to use the dim settings on your headlights to see where you are going. If the axle is ahead of the center of the load, you’ll become much better acquainted with your sphincter as your trailer fishtails down the road. How hard will it be on your fuel mpg? Unless you tow with a diesel dually, this is a real concern. As you probably expect, the heavier the trailer, the worse mpg you can expect. But as important as weight is, the presence or absence of streamlining (that WWII “bomber nose” thing again) is equally important. Likewise, the smaller the tow vehicle, the more important shape and weight are. This is a truly critical choice as your fuel mpg reduction can be as much as 60% for trailers with a steel chassis and steel sheet metal sides. Open steel trailers are not a solution either—the excessive turbulence creates more drag than the weight reduction eliminates. On the other hand, the mpg reduction can be as little as 5% for motorcycle trailers with “bomber nose” fiberglass bodies and aluminum chassis. How easy is it on your eyes? The range here is from open steel trailers and rapidly-fading metal boxes to sculpted “bomber nose” trailers with custom paint jobs. The sides on the metal boxes ripple as the sheet metal they are made of expands and contracts with the sun. Eventually, rivets and glue succumb to this continuing expansion and contraction and rivets pop and glue joints separate. By contrast, with a little care, the sculpted “bomber nose” fiberglass bodies tend to retain their smooth surface for years. How safely and securely will you able to trailer your bike(s)? Proprietary systems for holding your bike(s) upright while you tie them down. Some trailers are sold without any “fastening” devices in place. Most of the proprietary “fastening” systems include drive-in-step-off wheel chocks and properly located d-rings that will keep your bike safe in transit. However, U-shaped drive-in-step-off fall-over wheel chocks don’t work that well no matter how many straps you use or where the d-rings are located. Unless you invest in an enclosed trailer, your bike will clearly not be very secure when you trailer it. Nevertheless, even enclosed trailers can be easily stolen unless they are equipped with rear stabilizers whose raising and lowering mechanisms are inaccessible when the trailer is locked. How trouble-free is it? What could possible go wrong? Let’s see now. Tires can blow, bearings can run dry, brakes can wear unevenly, wiring can short out or get torn off, to name a few 0f the possibilities. So look for the best available ST tires (Maxxis or Carlisle), e-z lube bearings, self-adjusting brakes, and wiring that is well-protected with shrink wrapped connections. 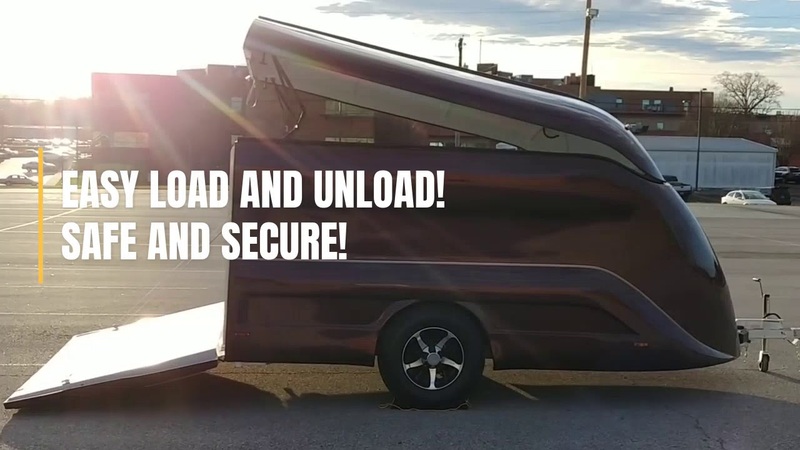 This great trailer can haul any single motorcycle with ease. Towing 2 Cruisers or 1 Trike has never been easier. This trailer will haul any 2 of the biggest bikes side by side. This flexible trailer accommodates one of anything up to and including one touring bike, golf cart or ATV. The largest open trailer handles anything up to and including two touring bikes, a golf cart or an ATV. Factory certified used trailers available. Bikers had the answers, we just had to listen. Who says you must sacrifice form for function? Streamlining is the only way to beat wind resistance. Why People Believe Ironhorse Trailers are worth the money! Choosing a Trailer for Your Trike ? Only fiberglass motorcycle company that has been in continuous existence over 15 years. Only motorcycle trailer manufacturer who configures trailers to each customer’s needs. Only gimmick-free, gas-friendly, and easy to use motorcycle trailers on the market. Only low-profile motorcycle trailers with flip top for safe loading and unloading. Only company that focuses exclusively on filling the needs of bikers who trailer. Only streamlined fiberglass trailers that are always ready to go when you are. Only no-assembly required streamlined fiberglass trailers on the market. Only trailers designed from scratch to economically haul motorcycles. Only motorcycle trailer manufacturer that will deliver to your door. Only motorcycle trailers with a red hot secondhand market. Only trailers with a meaningful four year warranty. We just returned from our southwest trip with our new Ironhorse trailer. I wanted to email you sooner but we were "very busy" on vacation. We put on a little over 4,000 miles and wished to share our experience. First, the trailer handled very well. As you can see, we were pulling it with our minivan and had no problems. On the trip down we encountered very strong and gusty crosswinds all through Illinois. The trailer was seemingly unaffected by the winds. With 2 medium weight bikes in it, hills were easily managed. The trailer brakes were more than sufficient when braking as well. The bikes stayed put in the wheel chocks with two binders(straps) on each bike. Placement of chocks and tie downs were great. Loading and unloading was quick and easy. I really appreciated the inside lights for loading at night. Trailer design was very well thought out, well balanced and obviously designed by bikers. Build quality and finish were very nice as well. A final comment: Your trailer allowed us to bike on some awesome roads (in the winter!) we never would have otherwise been able to do. (I'm too cheap to rent a bike and like to ride my own) . I have enjoyed this trailer more than any trailer I have ever owned and I have had a lot of trailers. I wouldn't part with this trailer for anything and just wanted you to know how much I love this trailer. Our trailer is great! It's two years old, we've towed it a bunch of miles collecting compliments all along the way, and everything about our Ironhorse is still perfect. Working with Julie and Ed at Ironhorse is a great experience...they are patient and kind, and they listen, help, advise well and make the whole transaction easy for their customers, so not only is the product wonderful but the experience of buying an Ironhorse is too. If you want to talk about owning an Ironhorse, or buying one, call Julie for my phone number and I'll be glad to tell you all about it! The trailer, AWESOME! I pull it with a 2007 Trailblazer SS and it tows wonderfully. The bikes fit great inside, lots of room, easy to load and strap down, fit and finish outstanding, I could go on and on. The trailer is gorgeous, couldn't be happier. These Ironhorse trailers blend functionality with style. I just purchased a 2011 single bike trailer and have to say I am totally pleased with the quality of the trailer, the answers and information Ironhorse staff provided, and the effortless sales transaction. I previously owned a 2000 Excalibur sport & business trailer and this Ironhorse is a whole new breed of quality. Thank you, again! As a proud owner of an IronHorse Trailer since 2006 I just want to let eveyone know what a great quality product it is and what fine people the Heards are! Julie and Ed Heard put their heart and souls into each trailer they build and stand behind their product 100%. If you want the #1 lightweight, "super trick", easy to load and easy to tow motorcycle trailer, with the BEST warranty in the business, you should give them a call! I just wanted to let you guys know how much I enjoy the trailer I bought from you last spring. I have made at least 8 / 1500 mile round trips from Ohio to Wisconsin with it this summer and don't know how I would get along without it! It you ever have a customer undecided about buying one feel free to have them contact me. I pull with a PT Cruiser (4 cyl) and average 20-24 MPG at 70-75 mph on the freeway...not too bad! WOW what a great trailer. It's a work of art on wheels. Thank You for all your help in choosing the right trailer. You delivered it on time for my vacation as promised. Please thank Julie for her help as well. Your delivery driver was fantastic and very professional. I'm sure it was a challenge to find my address in the middle of the city. People that live around here have trouble finding this place but, he had no problem. I will not hesitate to recommend Iron Horse to everyone. Ironhorse Trailers was founded in 2002 in Lavergne, TN, near Nashville. Our first home was a 4,000 square foot building on a side street. During that time, all our fiberglass parts were supplied by one subcontractor and all our chasses were supplied by another. By 2005, we had discontinued our original fixed top model, replaced it with two new flip top models and outgrown the building. After a two year search, we relocated to a new building about six times the size of our former one, on a four lane highway, and only about seventy miles away.